Designed to be easy to build for the beginner or professional woodworker. Uses special ball bearings which ensure the blades turn smoothly and quietly. Upper part of windmill swivels to catch the wind. Measures approximately 55" from ground to top of blade. Hardware parts available separately. 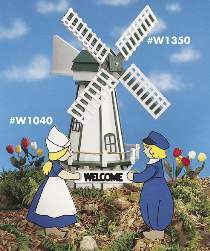 Little Dutch People stand ready to greet your guests with their Welcome sign (Plan #W1040). Approximately 28"H. Perfect companions for our Dutch Windmill project. Patterns drawn FULL SIZE. The #1307 Dutch Windmill Hardware is a 145-piece package that contains special flanged ball bearings, Lazy Susan bearing, dowels, rope, plus all bolts, nuts, washers and screws (project plan, wood and paint are not included). Special #1787 includes both plans, #1307 Windmill Hardware, #8572 Decal and the #8545 Mounting Kit. Special #2528 includes the #W1350 Windmill Plan only and the #1307 Hardware.